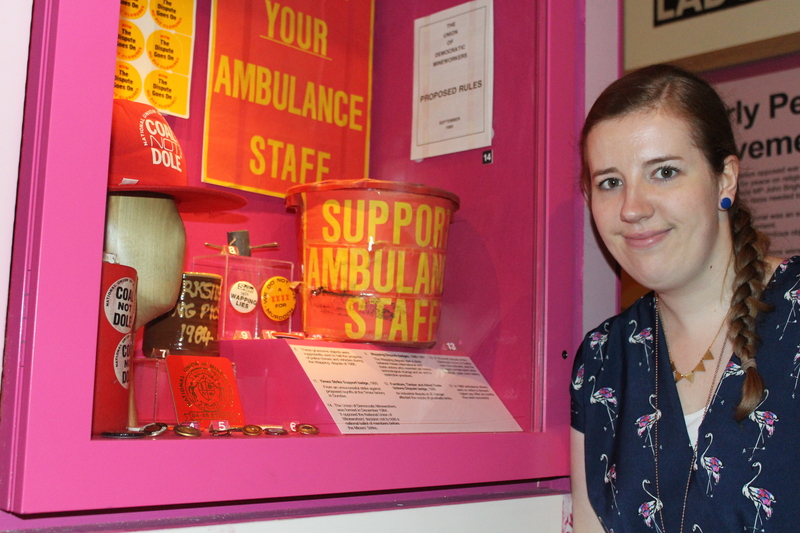 In the second of our ‘Staff Top Picks’ series, PHM Marketing and Development Officer, Daisy Nicholson, explains why the badges and stickers in the Citizens section of Gallery Two are her most-loved objects in our collection. 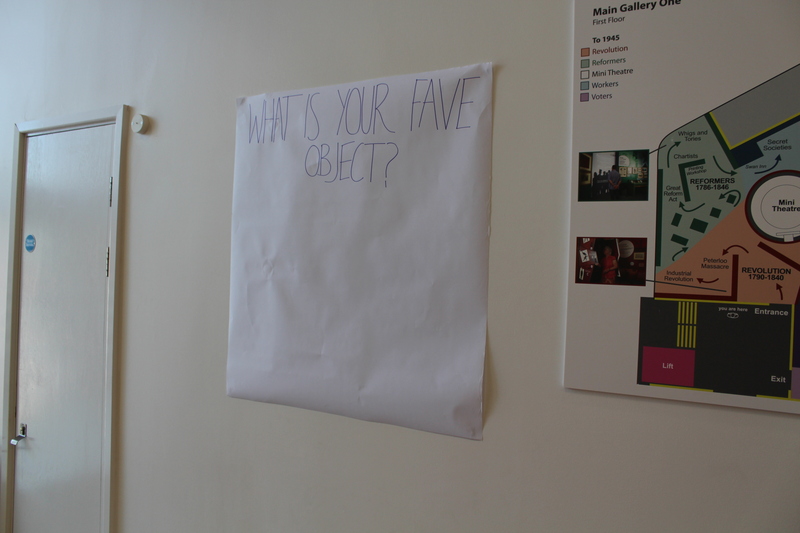 What’s your favourite item in the museum? Tell us on Twitter using #phmtop10. My favourite object(s) / bit of the museum are the badges/stickers in Citizens (pink) section – having grown up in the 80s and spent lots of time as a child on marches & demos etc. (very politically active dad! ), I loved collecting related badges and stickers, though at the time didn’t appreciate the various campaigns’ significance. Seeing such collections on the galleries is a nice trip down memory lane, but more importantly reflects the importance of preserving this aspect of history. 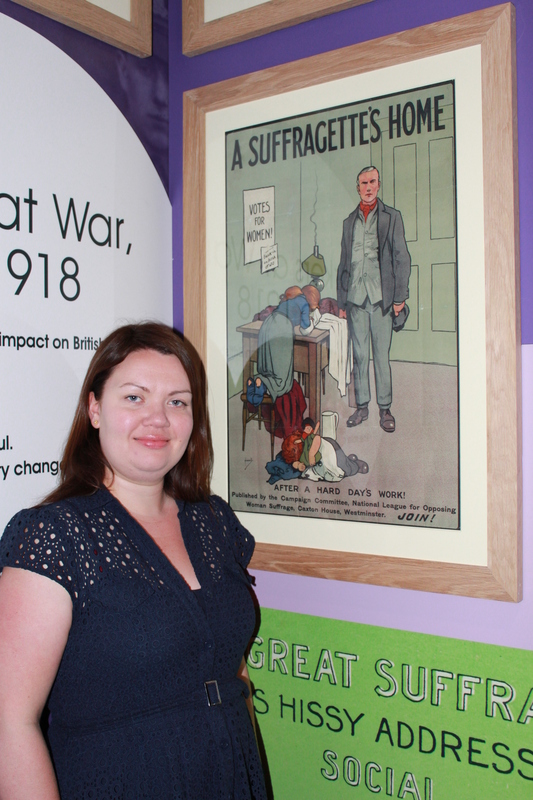 In the first of our ‘Staff Top Picks’ series, PHM Director Katy Archer tells us why the poster A Suffragette’s Home is her most-loved object in our collection. 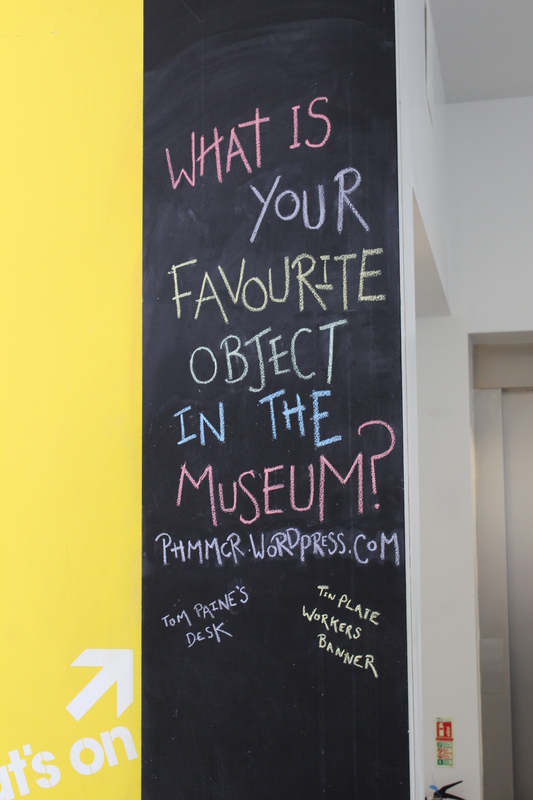 What’s your favourite item in the museum? 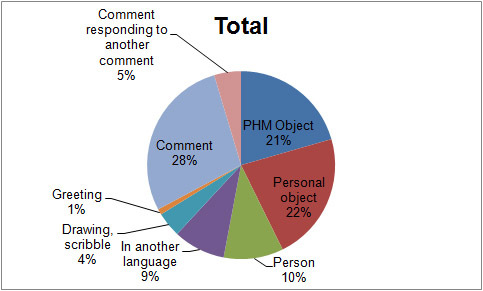 Tell us on Twitter using #phmtop10. One of my favourite objects is the poster – A Suffragette’s Home, produced by the National League for Opposing Woman Suffrage around 1910. The poster appealed to the working man who has returned home from work to find his hungry children in an untidy house. The poster stands out to me for a number of reasons. Its style, aesthetic quality and colour palette are striking and part of the iconic design of many posters of this era. The artist responsible for this poster was John Hassell who also designed the famous holiday poster, Skegness is So Bracing. I also think it’s interesting to see a poster arguing AGAINST something that can now sometimes be taken for granted. 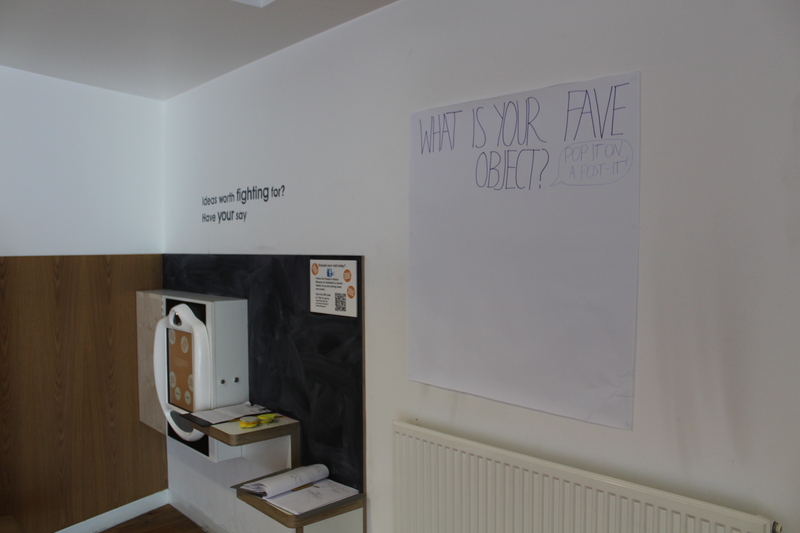 Votes for Women is such an important part of the People’s History Museum and we have a fantastic collection of objects representing this story, as well as other organisations in Manchester such as the Pankhurst Centre who are key to telling the story of Women’s Suffrage. PHM is a champion for the Wonder Women campaign commemorating how much will have been achieved in the 100 years from 1918 (when women first won the (partial) right to vote) to 2018. 1918 was the culmination of a long, hard struggle, and although we’ve come a long way, there is still much work to be done. With events, debate, music, art and more, Wonder Women is a five-year project that asks how far we’ve come – and how far we have yet to go. So for me this poster sums up that struggle – it shows how women had to make sacrifices for a cause that they believed in – and it shows that there have always been (and continue to be) ideas worth fighting for! It also reminds me that working towards a bigger goal and fighting for something you believe in is more important than keeping a tidy home – which is good to see as the poster also reminds me a little bit of my house when I get home from a day working at PHM! Experiment #1: Part 3 – the post its! D’oh!! We’d only gone and asked the wrong question! 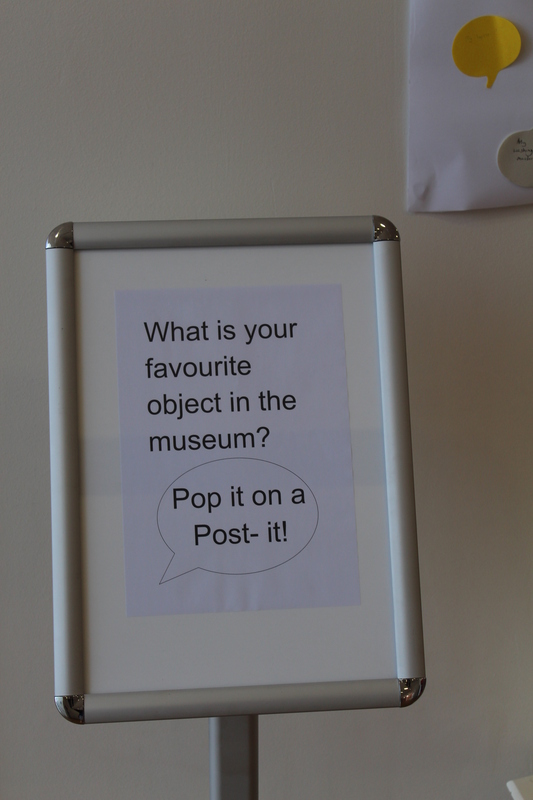 We should have asked ‘what is your favourite object in the museum?’. Massive lesson learned! 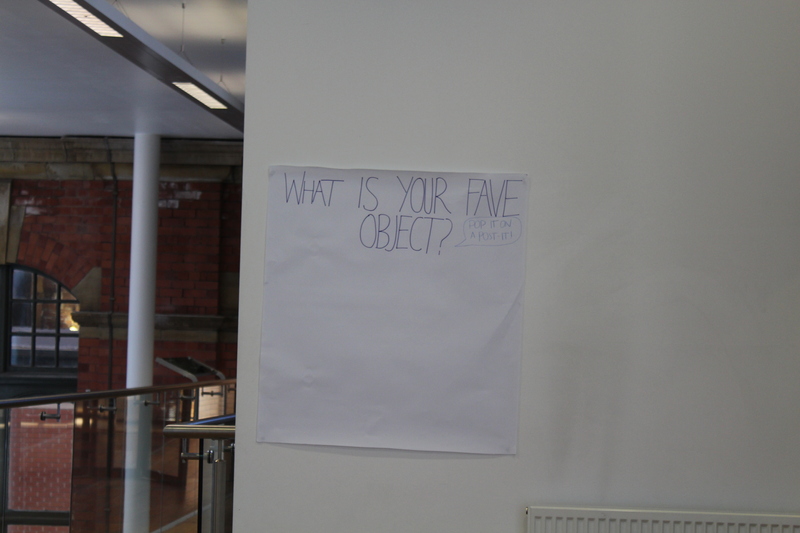 We put up a sign to try and get some more of the answers we wanted…. 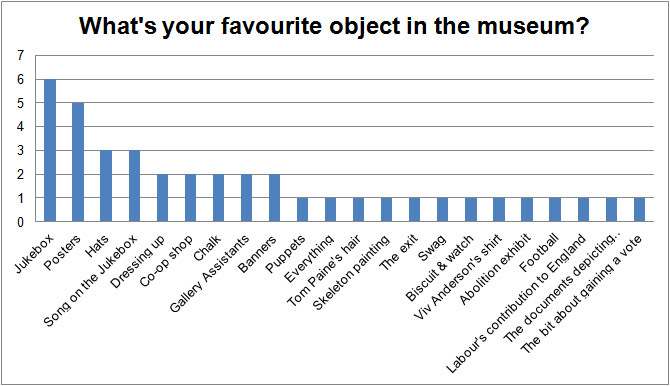 Fortunately this seemed to work and we did notice an increase in the number of favourite museum objects. 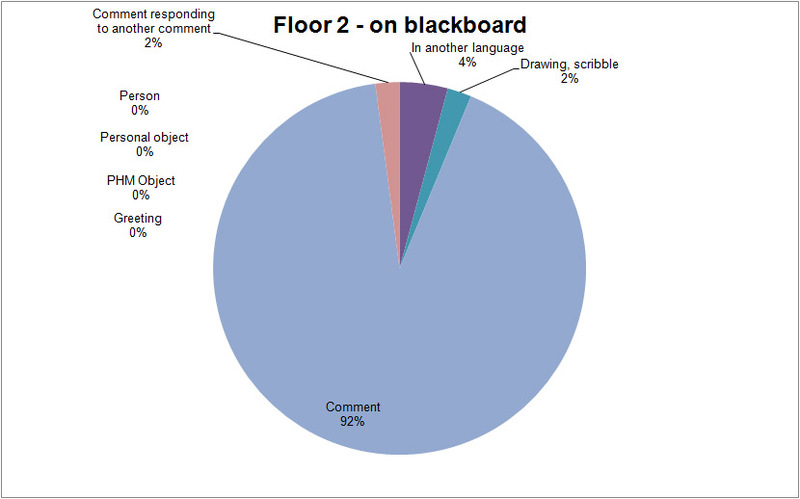 Interestingly, we got more comments via th e post it system than we did via the chalkboard. 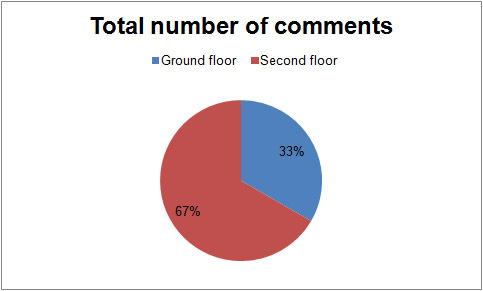 We got 114 comments over 16 days in the chalkboard system (an average of 7.125 comments per day) and 302 comments over 13 days (23 comments per day) in the post it system. 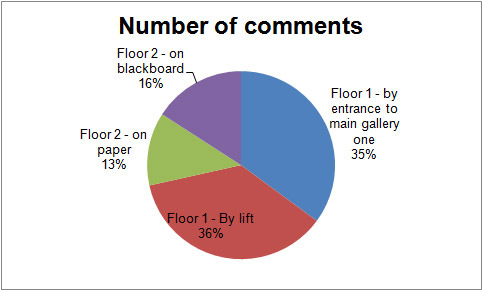 Admittedly, we did have more places to add comments for the post its (2 pieces of paper outside Main Gallery One, 1 piece of paper outside Main Gallery Two, and visitors also posted comments on the chalkboard outside Main Gallery Two), but there was a substantial rise in engagement. 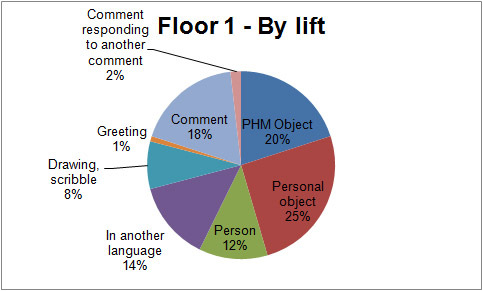 This may have been a result of the positioning, the medium or perhaps visitors engaging more with the question they thought we were asking. 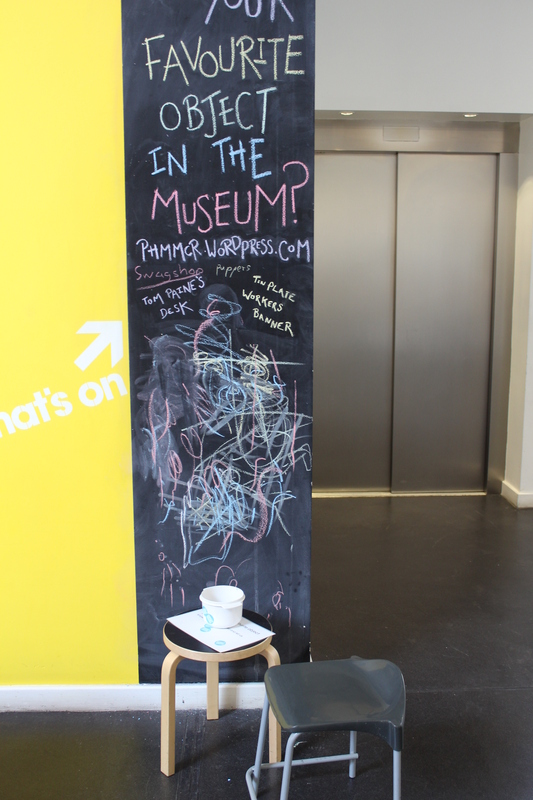 35% of visitors told us their favourite object in the museum when we asked the question on the chalkboard. 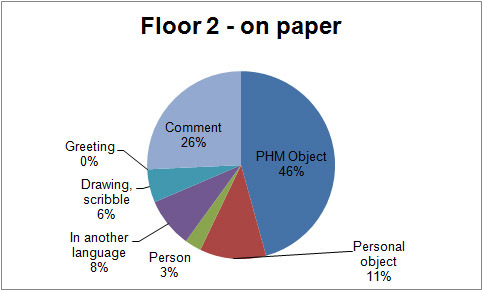 Only 21% of visitors did when we asked the question on the post its (although this figure raises to 51% when you include visitors’ favourite personal objects). 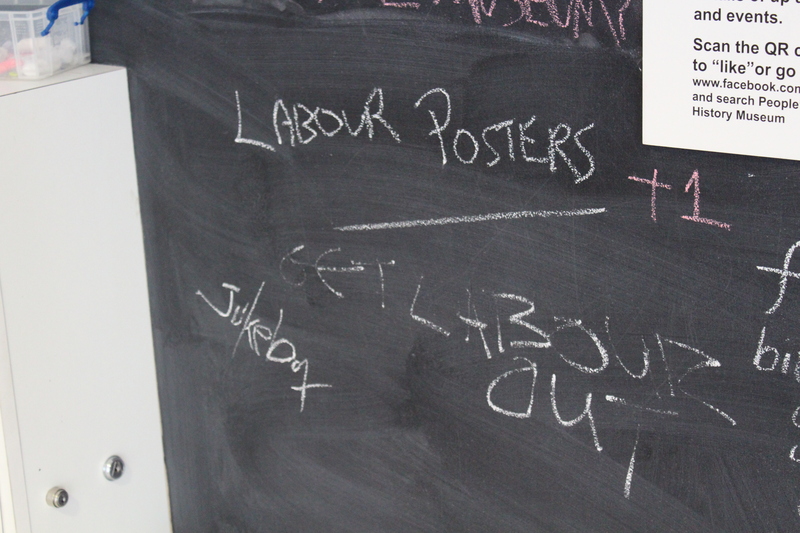 The vast majority of the comments were outside Main Gallery One, where we didn’t have chalkboards previously. This appears to be a good location to engage our visitors and is definitely something to explore later in the project. 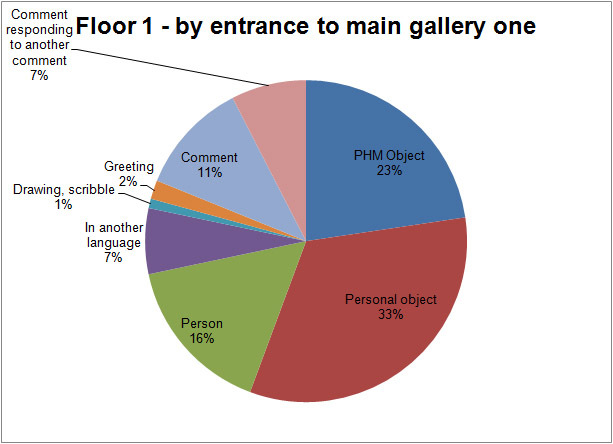 Surprisingly, there were no favourite objects (PHM or personal) stuck on the chalkboard outside Main Gallery Two. 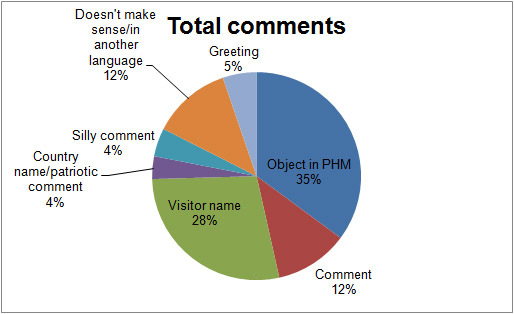 This may have been because the question was not posed there, so visitors felt more freedom to comment on other areas. 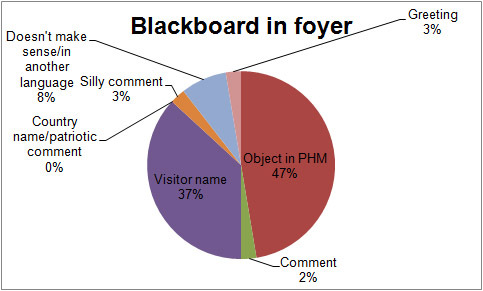 The favourite PHM objects were very similar to when we asked on the chalkboard. When you combine the results the jukebox is th e clear favourite! 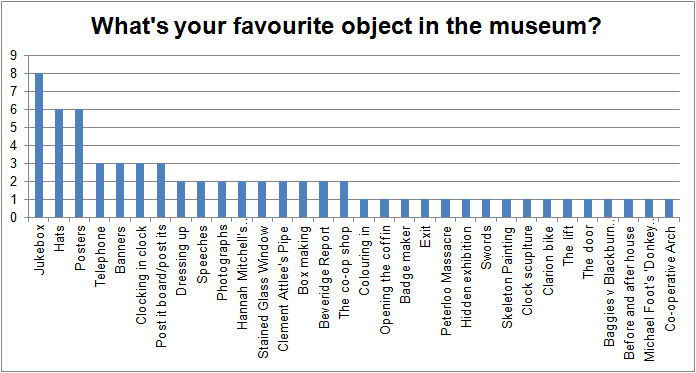 Next step is for visitors to vote out of the top three objects – will the jukebox be the victor again?